Wet blocked the Knittin’ Pretty Shell today. I’m not sure whether it will dry fast enough to finish this weekend. I have my regular knitting group tomorrow, but it will have to be 100% ready to unpin by tomorrow morning, and that just seems a little fast. It ended up a bit longer than I expected. I’m fairly confident I measured at ~20″ above the lace edging originally (with the lace edging adding about 2-3″. The final piece is looking to be about 27.5″ long, and the edging is ~2.5″. I didn’t stretch it much vertically myself while pinning it down, so I’m not sure where the extra 5″ came from. The arm holes are about 7.5″ high, so it should still fit fine, just be a little longer than I thought. I didn’t have any issues with the width. The lace part wanted to be a little bit wider, but the main stockinette stitch seemed to fit comfortably at the 16″ width. 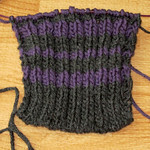 After finishing the shell knitting, I frogged one of my original swatches to make this curvy swatch. 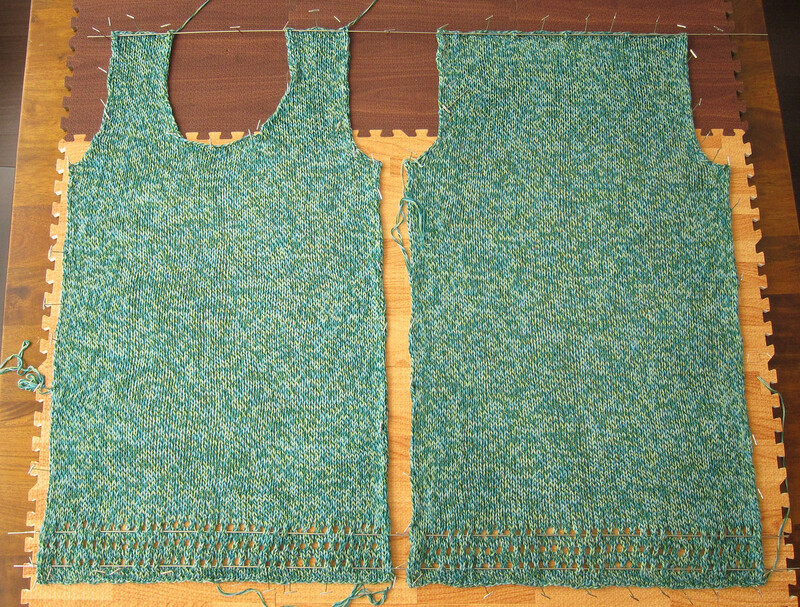 The pattern (optionally) suggest crocheting around the neck & arm holes. The Ravelry project that inspired me to use this particular yarn used a solid color for edging and I rather like the effect. I have some size 3 cotton thread I think will work really well color wise, but I will probably need to double or triple to get the right effect. 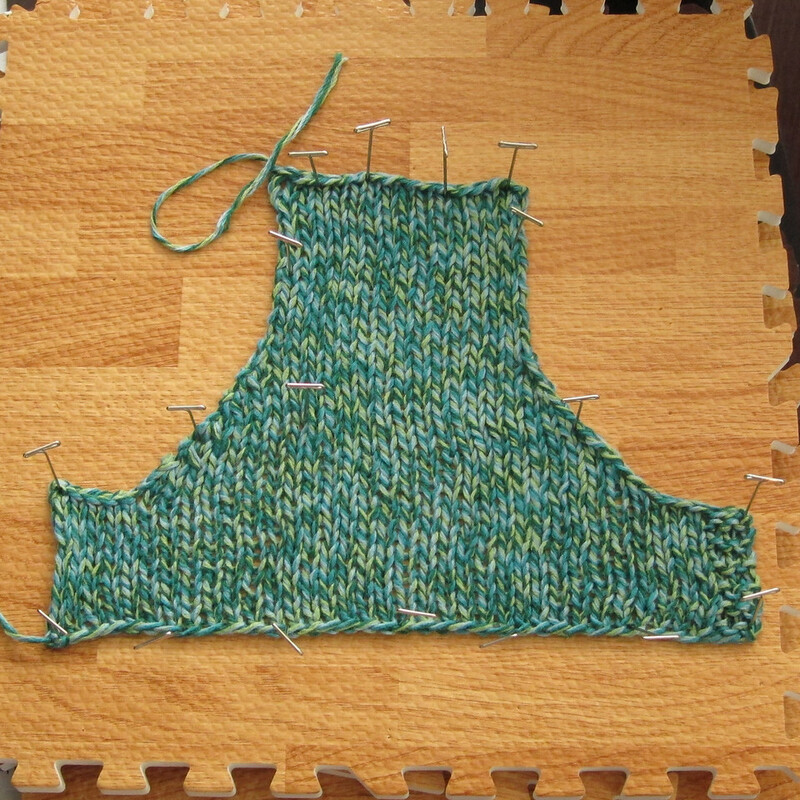 Rather than experiment on the final product, I’m hoping this curvy swatch will let me figure out what will look good. I wasn’t sure if there would be a noticeable difference trying to edge the blocked vs unblocked knitting, so I figured I may as well block this, too. I haven’t made any progress on my Kinetik in about a week. I haven’t had much crafting time that didn’t involve too many distractions, and this is definitely a project that requires concentration. It’s a little frustrating having the feeling that I’m “falling behind” in the knitalong. Laura Nelkin has really been driving a great community around this mystery knitalong in her Ravelry group, which has been really encouraging! It’s looking like I might have a little more time for this in the week ahead, so I’m hoping I’ll be able to finish up Clue #3 soon and start working on Clue #4. 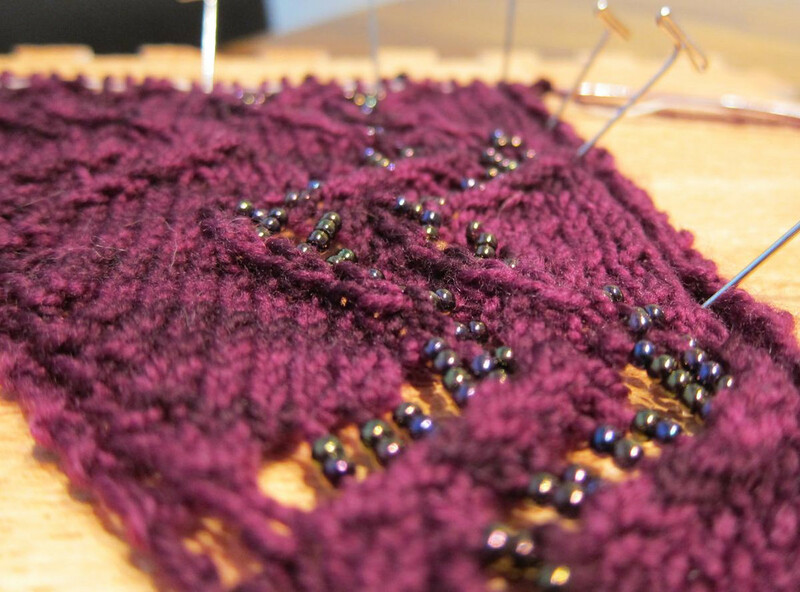 I’m still not sure exactly what this is going to be (it’s a mystery knitalong), but it looks pretty! Since I had a gap where there was no more knitting for the shell and my Kinetik is too intense to work on while I’m commuting, I started another Chicks With Sticks pattern: Coed Ribbed Wrist Warmers. This is proving to be a quick knit. I’m looking forward to having something to keep my hands warm in the office! I originally intended to just knit these in the round, even though the pattern is written flat, so I could avoid seaming. However, I got it into my head that I really wanted to try a tubular cast on, and most of them have dire warnings about trying to do the cast on in the round. 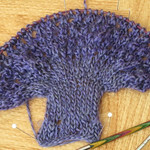 (I ended up following Ysolda Teague‘s Long Tail Tubular Cast on for 1×1 or 2×2 Rib.) I could have joined after the cast on was finished so I only had one or two rows to stitch up, but I was feeling a bit lazy and decided to leave it flat. Besides, this way I can figure out where to leave the thumb hole to fit me properly after I’ve completed the knitting rather than risking having to rip rows out if I guess wrong. Seaming isn’t that painful, after all. I’m not sure what kind of bind off to use. My searches on tubular cast on for 2×2 rib yielded some tantalizing suggestions that there might also be similarly invisible bind offs, but I haven’t jumped down that rabbit hole yet. 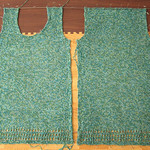 Author pxl8Posted on February 6, 2012 February 11, 2012 Tags knitting, work in progressLeave a comment on Now what? Time sure flies when you’re having fun! Most recently I’ve been working on Christmas gifts. I’m pretty excited about them, but I’ll hold off on talking about them so the recipients can be surprised. I’ve actually been surprisingly prolific over the last nine months. I’ve finished off 24 projects (at least, as I’ve set them up on Ravelry). Embarrassingly, my Making Links Chain Reaction Afghan Square is still awaiting blocking. I have 3 more projects still in progress, including Elisa McLaughlin‘s Britta Lalena Headwrap/Earwarmer being worked up in Regia Hand-dye Effect sock yarn. 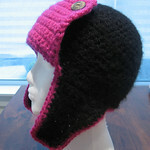 I’m really looking forward to finishing this because it’s definitely earwarmer weather in Seattle. Only one of the unfinished projects is intended as a Christmas gift, so I’m feeling pretty confident I’ll be able to get it done in time. Over the past few months I’ve also been remiss about photographing my creations, much less posting about them. I’ve already made some progress on catching up with the photography, and hope to catch up on posting about some of the more interesting projects I’ve been working on. Recap of knitting & crochet projects over the last couple months, particularly recently completed: Fluffy Pink Scarf (of Doom), Trophy Scarf, Dirty-Girl Washcloths, Rainbow Hook Roll, Da Bomb, Steelers Bomber, Myrtle Beach Washcloth, 5th Bomber, and Making Links. Also, a look at upcoming projects! So many projects, and many of them from the last two months! 1. 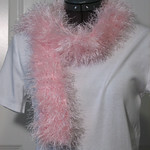 Fluffy Pink Scarf (of Doom), a present for my youngest niece’s birthday. 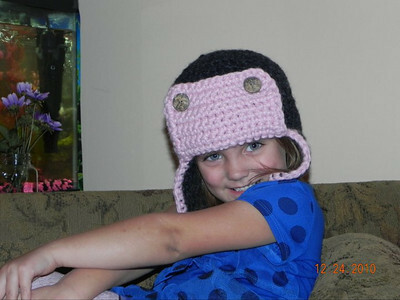 This was my “first” knitting project. It was super simple garter stitch with two strands of Fun Fur held together using very large needles. 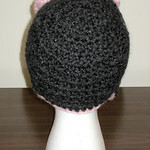 Being so new to knitting, this project was quite difficult as the Fun Fur made it very hard to see what I was doing. Of course, it also meant that my (many) mistakes were not visible! 2. In January, I finished off the Trophy Scarf. (Big thanks to Allie for coming up with the best name!) 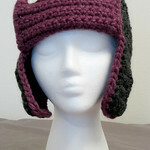 It’s a pretty easy crochet pattern, which I will post in a future blog entry. I’m happy with how the scarf turned out; I almost kept it for myself! I can’t tell you all how much I loved the yarn I used on this, Manos del Uruguay Silk Blend. This ended up taking a lot more yarn than I had anticipated. 3. After my experience with the Fluffy Pink Scarf (of Doom), I started working through the Dirty-Girl Washcloths (from Chicks with Sticks Guide to Knitting) in order to improve my knitting skills. 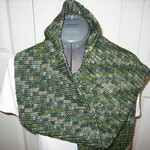 There are three washcloths in the pattern, one in garter stitch, one in stockinette, and one in basketweave. Although the washcloths look a little sad (the edges are all uneven), I consider this project a success. My goal was to practice some basic stitches and start training my muscle memory, get a feel for how things should look, etc. and this project was very successful in that regard. 4. The Rainbow Hook Roll I mentioned in a previous post. Most of the construction went pretty smoothly, but I had a fair amount of trouble with crocheting into the row ends, which is why the hook roll is not square. I belatedly discovered that Interweave Crochet’s Winter 2010 issue had an article specifically about crocheting into row ends. I’ll likely make another one of these (more hooks, plus need to store DPNs somewhere! ), so maybe that article will help me figure out what I’m doing wrong. 5. 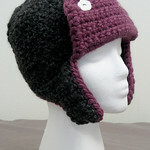 My 3rd Bomber Hat (aka Da Bomb), for my middle sister. 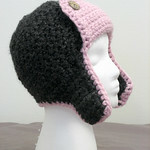 After she saw the bomber hats I’d sent for Christmas, she requested one of her own in hot pink and black. The yarn I’d used for the previous two, Lion Wool-Ease Thick & Quick does not come in a pink any brighter than the one I’d already used, so she sent me a couple skeins of Lion Jiffy. 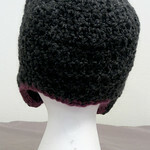 Jiffy is a bulky (category 5) yarn, rather than a super-bulky (category 6) yarn, so I had to make several modifications. I’m pretty pleased with the final result. 6. My 4th Bomber Hat (aka Steelers Bomber) for my stepmom (interestingly also requested by my middle sister). I went back to a super bulky yarn, but tried yet another one (again, needing specific colors): Lion Hometown USA. I actually really like this yarn. It’s easy to work with and feels surprisingly nice for a 100% acrylic yarn. Unfortunately, 1 skein of Hometown is not quite enough to finish the main portion of the hat, so the project is on hold until my additional yarn arrives next week. 7. 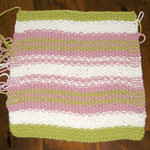 My knitting group opted to do the Myrtle Beach washcloth as a knit-along. 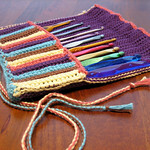 This was another great learning pattern: seed stitch and color changes! Unfortunately I did the simplest color change method – cutting the yarn every time – rather than something more elegant, so I’m still working on weaving in all the ends. A helpful fellow Raveler gave me a great suggestion about how to avoid all the cut ends, but it came too late to help me on this project. I’ll definitely be trying this next time I have this sort of frequent color change. 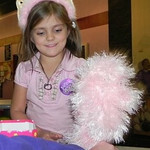 I did find working with Lion Cotton-Ease to be much easier than most of the pure cotton yarns I’ve worked with before. It’s a little bit splitty, but it does have a nice almost microfiber texture. No, I don’ t know what I’m going to do with all of these washcloths! 8. 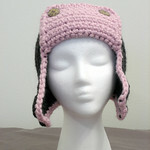 My 5th Bomber Hat (sorry, no clever name) for my youngest sister. All of the crochet work is done; it’s just waiting on me to block it and attach the buttons. This one was made from Berroco Peruvia Quick, which I also enjoyed working with. Although categorized as super bulky, it worked up a little more open than the Lion yarns I’d used for my nieces hats and the Steelers Bomber. However, I didn’t have to make modifications to the pattern as I did when using Jiffy for Da Bomb. 9. Making Links Chain Reaction Afghan Square, from Interweave Crochet’s Summer 2010 issue. 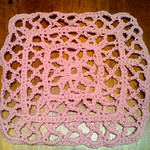 I’ve decided that I want to attempt to make an afghan utilizing all of the Chain Reaction Afghan squares. To date, I believe that 15 have been published (Interweave Crochet Summer 2010, Fall 2010, Winter 2010), plus 3 more “bonus” squares over on CrochetMe.com. I think there are 10 more official squares to come. I haven’t decided what I’ll do with said afghan, or set any sort of timeline on it. I figure I’ll just work on the various squares as I feel like it. 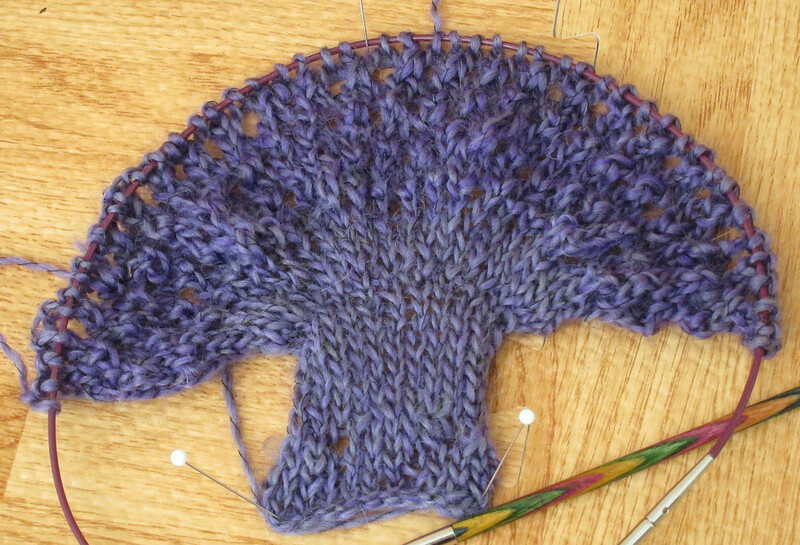 For example, I started this one because I needed a backup project for my most recent flight. I knew I’d probably finish the (undisclosed baby item) I was working on, but I wasn’t quite ready to start on the next big project during that trip. 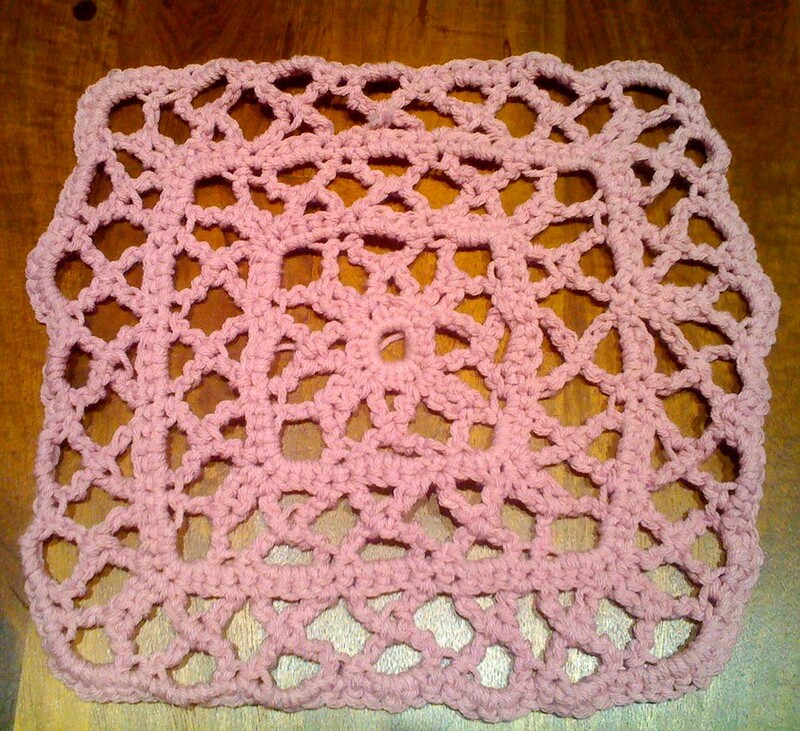 I’m reserving judgment about this square until I block it; I think it’s growing on me, though. 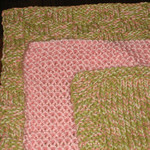 This was done using some of the Lion Cotton-Ease left over from the Myrtle Beach Washcloth. 10, 11, and 12. And three super secret projects for a friend’s baby… more on those after said gifts have been delivered! Whew! That’s a lot! I’ve started 8 new projects since the beginning of the year. The Fluffy Pink Scarf (of Doom) was completed last year. Two projects I started last year completed this year (Trophy Scarf and the Dirty-Girl Washcloths) were completed this year. I’m 100% complete with 3 projects I started this year (Rainbow Hook Roll, Da Bomb, and one secret baby project), and have 4 more just waiting for some finishing touches. Finishing off those almost done projects! After reading a post on the crochet me blog about blocking crochet lace, I’ve ordered a small set of interlocking foam mats to use as a blocking board. Baby project #3, a knitting project, is already in progress. Further out than that, it’s hard to say. I’ve decided that I really want to make myself a Geometry Dress; I think it would be a great summer piece for me. I’ve also been wanting to make some Fluffy Bunny Slippers, but given that we’re moving out of slipper season those will probably wait for fall. I’ve been considering making a Moth Wings Shrug to wear to my youngest sister’s wedding in May. 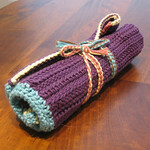 Also, I’m eager to try making the Artisan Belt from Chicks with Sticks Guide to Knitting. I guess you’ll just have to keep reading to find out for sure! 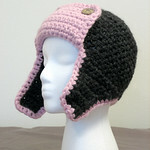 Catching up on finished projects – first up, the Bomber Hats I made for my nieces last Christmas. 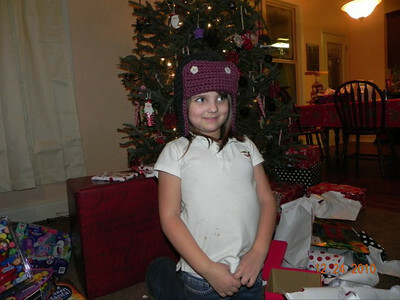 This past Christmas I decided to make Bomber Hats (pattern by Adrienne Engar) for my nieces. These were done in Lion Brand Wool-Ease Thick & Quick (Fig, Blossom, and Charcoal colorways), as recommended. The buttons for both hats were from a stash of mixed buttons I picked up at a craft store in Chicago years and years ago. I actually ended up making these twice. Although I was following the pattern size 3 (child: 3-8 years), the hats turned out far too large; one of them was even a bit large on me! As you can imagine, by the time I really finished them, I was quite familiar with the pattern. 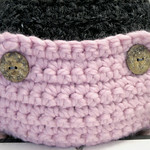 Author pxl8Posted on February 25, 2011 February 26, 2011 Tags completed, crochet, hatLeave a comment on Bomb(er)s Away! 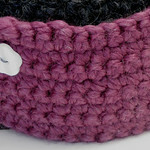 Updates on my current works in progress: a knitted washcloth and a crocheted hook case. Christmas gifts are finally complete – even my last straggler – so it’s full steam ahead on other works! After my “first” knitting project; which did become a Christmas present for my youngest niece, I decided I needed to do something simple to start training my hands what knitting feels like. I picked up Chicks with Sticks Guide to Knitting as my intro book, and I’ve been working through the Dirty-Girl Washcloths. I started the first of the 3, an all garter stitch washcloth, right after Thanksgiving. For reasons I no longer recall, I opted to do that one in a pink worsted-weight acrylic I had on hand rather than wait until I could get back to my stash and get started with some cotton yarn. I’m not particularly thrilled with the end result (too large, uneven, and not the greatest yarn choice for a washcloth) but it did really help me get that knit stitch ingrained! 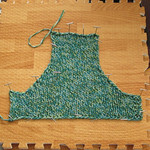 I’ve started the second washcloth, in stockinette with a garter stitch edging. This one is being worked in “Bernat Handicrafter Cotton Twists.” According to the pattern, I should be done by now as I’ve reached the right number of rows. However, I decided I wanted it a little bit closer to square, so I’m going a few more rows on it. Not too much longer before I start on the final one! 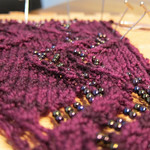 I thought about returning to my unfinished Go For Baroque sweater, but I’m not quite ready to pick that up yet. Instead I’m ramping up the hook roll from Lisa Nakrent’s Rainbow Rolls pattern. 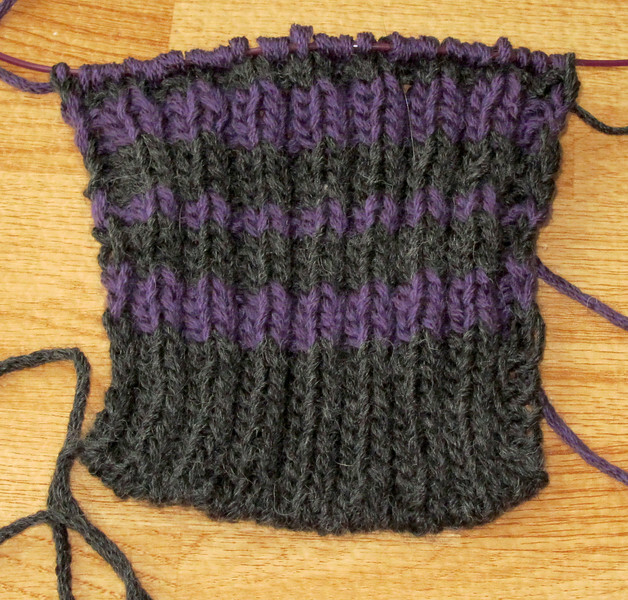 Currently I’m working on a gauge swatch. 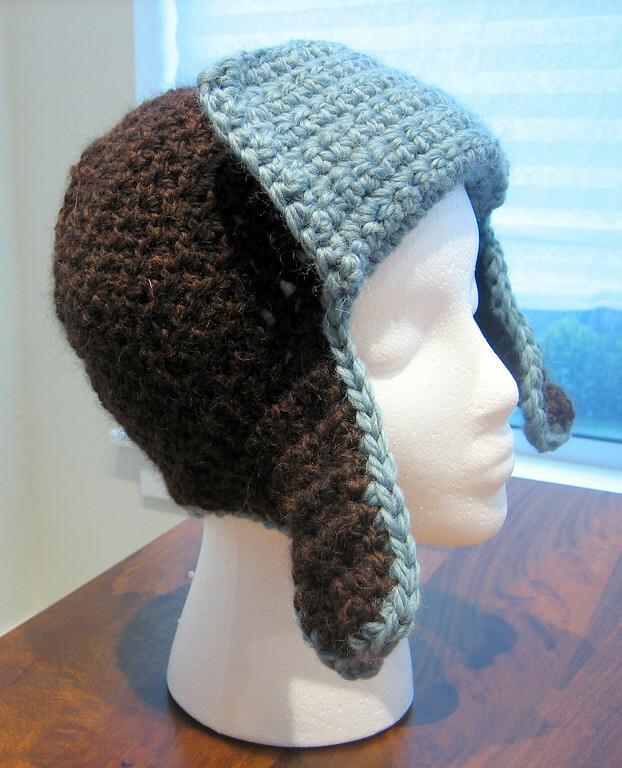 The pattern calls for Halcyon Yarn Casco Bay Sport, which I couldn’t find at my usual yarn sources. So, I’ve substituted Berroco Pure Pima. I’m pretty excited about this yarn. The colors are very vibrant and it feels great. I hope it will be nice to work with. 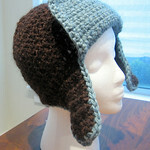 Review of Adrienne Engar’s Chunky Ear Flap Hat crochet pattern. Christmas crafting is almost done! Only a little while longer until gifts are opened and I can start posting about what I’ve been up to for the past few months. 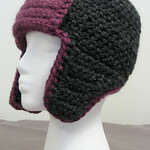 In the meantime, here are two hats that I worked on earlier this fall. How it went: The pattern itself was very easy and very quick. I think each hat took me just a few hours. I could have done both of them in a single dedicated day of crochet. Gauge turned out to be more important than I would have expected for a project of this nature. I found it very easy to make this hat far too large with the recommended yarn & hook, but going down a hook size resulted in a hat that was far too small. I attribute this to my interaction with the yarn rather than the pattern itself. 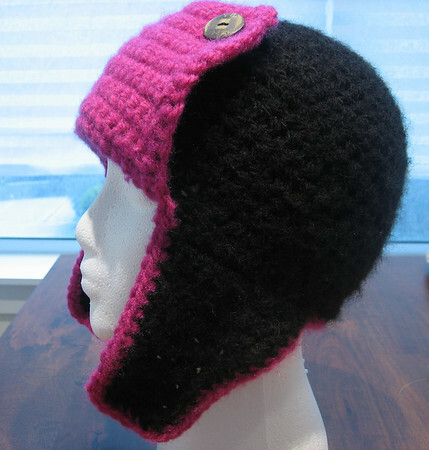 Bottom Line: I’d definitely recommend this pattern to someone looking for a warm, stylish winter hat – particularly if you’re looking for something quick.